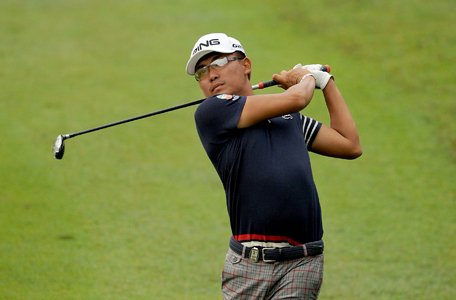 Kuala Lumpur, 22 October 2014: Nicholas Fung aims to rise to the occasion in his second appearance at the cash-rich CIMB Classic from 30 October to 2 November, after earning a coveted place as the highest-ranked Malaysian on the Official World Golf Ranking. The 24-year-old Fung experienced a subdued debut at the Kuala Lumpur Golf and Country Club (KLGCC) last year, finishing 63rd in an elite field of 78 players at the US$7 million tournament sanctioned by the PGA TOUR and Asian Tour. He will be joined by countryman Danny Chia, who qualified through the SapuraKencana National Qualifier, in the starry-field which will be headlined by title holder Ryan Moore, 2014 FedExCup champion Billy Horschel, Ryder Cup heroes Lee Westwood and Sergio Garcia, and Japanese stars Hideki Matsuyama and Ryo Ishikawa. “I’m so happy that I can play in the CIMB Classic for the second time. We will have another strong field again and I’m excited to be in such a great line-up,” said Fung. Fung, currently ranked 39th on the Asian Tour’s Order of Merit and 392nd in the world, hopes to produce another strong end-of-year run. Last year, he finished tied fifth and second in Manila and Indonesia respectively to finish a respectable 36th on the final Asian Tour rankings. He is confident of a better showing at the KLGCC’s West course after ending his jinx by finally making the halfway cut at the venue for the first time in seven attempts at the Malaysian Open in April. “The West course does not suit my game but my results there have improved. I made the cut earlier this year and that has given me some confidence,” he said. “I’ve gained some distance off the tee and that will help at the West course. I’ve been doing more stretching and eating healthily and I’ve gained at least 10 yards with my driver. Fung opened last year’s campaign at the CIMB Classic with rounds of 74 and 78 but improved over the weekend with a 71 and 70. Like the old adage – drive for show and putt for dough – the slightly built Malaysian knows he must get his short stick to strike it hot on the greens. “These guys putt so well and I’ve been trying to improve on my putting. I had trouble reading the lines so I’ve been working very hard with my father and coach Toshi Wasa back home. I don’t think I have any problem with my long game. It is only my putting which I have to improve now,” he said. The CIMB Classic, which is also sanctioned by the Professional Golf Association of Malaysia, is part of the season-long PGA TOUR FedExCup competition. The event was inaugurated in 2010 and is the only official PGA TOUR event to be held in Southeast Asia.